When we talk about energy efficient building, everyone wants to know about the R-value. “R-value” (that’s the inverse of the BTUs of heat transferred per hour per across a square foot of surface area per difference in temperature, in degrees Fahrenheit, on either side of the surface, for your science-types) is a measure of how well an insulating material slows the eventual loss of heat through the exterior surfaces of a building. It is a fundamental law of thermodynamics that all of the heat that we contribute precious fossil fuels to put into a building will eventually leave it, for the same reason a cup of hot coffee left on a table at room temperature will eventually cool off. But, if a building is built with materials that have higher R-values, it will lose that heat more slowly—like putting that coffee in an insulating thermos. To reduce the energy use in buildings, most states in the US (but not all) have minimum building code requirements for how much R-value each portion of a building should have. Green building practices often aim to exceed well those code requirements. R-value is well and good—but it’s not the whole story, nor even the most important part of the story. Heat transfer comes in multiple forms, and one of the most important strategies for energy efficiency construction comes from paying attention to an entirely different method of heat loss, far too often overlooked in the construction industry. That’s the heat you lose when the heated air itself migrates outside, through all of the myriad cracks and holes within a building that allow it to escape. And most buildings, even new ones, are full of holes for air to leak through. Before—or at least in conjunction with—worrying about the R-value, in green and energy efficient construction we should be quite concerned about a building’s airtightness, as well. 1. Every unit of air leaking out of a building is replaced by a unit of air coming into that building from somewhere else. 2. The make-up air coming in will be from the outside, having the same temperature and humidity as outside air. The systems in your house whose job it is to condition the air – to make it the right temperature and humidity – work by sensing the temperature and humidity of the air in the house. They will turn on whenever there is a large enough presence of air that is not the right temperature or humidity. 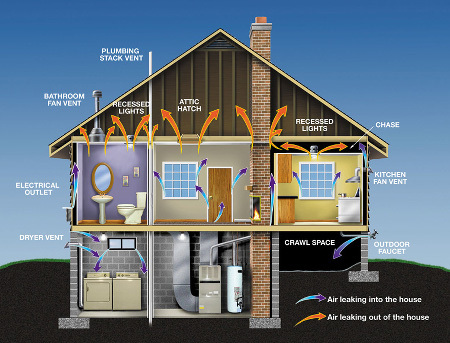 More air leaking in that needs to be conditioned means more work for those systems, means more energy consumed by those systems to bring your house back to the right temperature again. How Do We Make a Building More Air-Tight? By sealing it! Numerous goops and sealants are out there; available at home improvement stores and waiting for intrepid homeowners to paint, glop, or spray into the cracks and holes in their walls, their attics, their floors. Insulation products such as spray foam insulation are often recommended for new green buildings; because spray foam insulation sticks to the surfaces, it is applied to and seals them. (All other insulation products allow air to pass through them.) However, you don’t have to use spray foam insulation to make your building air-tight, and simply spray foaming a building is a guarantee of exceptional performance. With new home construction, green building certification programs certainly recognize the importance of air-sealing. Many have a specific list of common places for air leaks that must be sealed; many even require that the house is tested for air-tightness. Which is a good thing, too, because while any homeowner can find cracks and holes to seal within their attic, some of the holes in a building can only be (easily) sealed while the house is being built before insulation and drywall bury them into obscurity. If you are building a new home, it can’t hurt to follow the Energy Star for homes Thermal Enclosure Checklist. A final note is on that vacuum problem I mentioned earlier. Luckily, no matter how methodologically we apply our caulk guns and spray foam nozzles to air-sealing, it would be impossible to turn your house into a vacuum; a building is too complicated and has too many joints and seams. However, it is possible to make a building so air-tight that the air inside becomes stale and polluted. The solution to this problem is to mechanically bring in fresh air ventilation—taking the uncontrolled situation of air leaking into and out of a building at random and turning it into a precisely controlled situation. We’ll talk more about that in a later post. In summary, buildings lose heat through multiple mechanisms. Boosting your R-value tackles conduction only while adding air-sealing starts to look at the heat loss associated with moving air. Both of these are crucial to consider in making a building energy efficient. Leigha Dickens is the Green Building Coordinator and resident building scientist at Deltec Homes, Inc in Asheville, North Carolina. Deltec manufactures round, energy-efficient, high-quality and highly wind-resistant homes. Learn more about green building with Deltec Homes at www.deltechomes.com/green-building/.